Gaps, stains, chips, cracks – many patients feel overwhelmed when they look in the mirror and see so many smile imperfections staring back at them. If you’re interested in a comprehensive smile makeover, consider porcelain veneers here at Murphy Family Dentistry. These highly customized and attractive dental restorations are designed to transform smiles for the better in as little as two appointments. Contact us today to schedule a free consultation with Dr. Najari or Dr. Nguyen. 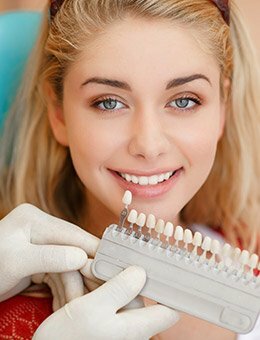 Why Choose Murphy Family Dentistry for Porcelain Veneers? Veneers are made from thin pieces of durable, high-quality porcelain and bonded to your front teeth to erase common flaws like those listed above. In most cases a full veneers procedure can be completed in as few as two visits to our Murphy, TX dental office. During the first phase of your treatment, Dr. Najari or Dr. Nguyen will prep your smile by removing a small amount of surface material from your front teeth. This will ensure that your veneers lay flat and look natural. You'll wear a temporary set of veneers while our lab is crafting your permanent veneers. When your custom-made veneers are ready, you'll return to our office to have them placed.